Western Digital on Tuesday introduced its fourth-generation enterprise-class hard drives filled with helium. The HGST Ultrastar He12 HDD can store up to 12 TB of data, whereas its version based on shingled magnetic recording technology has a capacity of 14 TB (note, both are under the He12 brand). It is noteworthy that to increase the capacity of the HDD, Western Digital had to increase both the number of platters in the new drives as well as their areal density. The HGST Ultrastar He12 is built upon a completely new platform featuring eight platters, up from seven inside previous-gen drives that use Western Digital’s HelioSeal technology. The manufacturer does not reveal a lot about the new HDDs, but it looks like as the company has learned more about helium-filled drives and managed to squeeze eight platters into a 3.5” HDD to increase capacity. To add the eighth platter, Western Digital had to redesign internals of its HDDs (including arms and heads) significantly. Over the next few months, we will probably learn more about HGST's fourth-generation HelioSeal platform in general and the new HDDs in particular. Moreover, Western Digital recently said that the HelioSeal is here to stay for a long time as demand for high-capacity SSDs is growing. Therefore, helium will be used not only for PMR- and SMR-based hard drives, but for HDDs featuring future magnetic recording technologies as well (i.e., HAMR, BPM, etc.). The increase of the number of platters inside the Ultrastar He12 was not the only way to raise its capacity, as Western Digital also had to increase the areal density of each platter. The Ultrastar He12 with a 12 TB capacity featuring perpendicular magnetic recording technology has an areal density of 864 Gbit/inch2, whereas the Ultrastar He12 with 14 TB capacity and SMR technology has an areal density of around 1000 Gbit/inch2. The increase of helium-filled HGST Ultrastar capacity by 20% to 12 TB brings very significant benefits to operators of cloud and exascale datacenters as such drives significantly increase total storage capacities. For example, each standard server rack can store 2400 TB of data if fully populated with 10 TB HDDs today. If 12 TB hard drives are installed into the same rack, its total storage capacity increases to 2880 TB at the same power and at the same space, which is quite an upgrade. Moreover, if owners of datacenters are willing to alter their applications and add support for SMR management (i.e., sequentialize their writes and minimize random writes), they can increase total storage capacity of one rack to 3360 TB without tangible increases of power consumption (if any, after all, SMR management should not take a lot of CPU time or significantly increase I/O transactions) and at the same space. The Ultrastar He12 14 TB was designed primarily for archival applications, where data is written sequentially in huge chunks (and is hardly ever updated) and where peculiarities of SMR do not have a significant impact on performance (except certain scenarios). Archives of social media, backups, multimedia files and other almost never get updated and SMR HDDs are perfect for them. A 40% increase of storage capacity in one generation is very substantial for cloud datacenter companies and they may get inclined to invest in both hardware and software just to get some extra storage. In fact, the considerable capacity increase over currently used 8 and 10 TB hard drives may make the Ultrastar He12 with 14 TB capacity a more popular product than the Ultrastar Ha10, the first host-managed SMR drive from Western Digital that never became widespread. Just like in the case of the previous generation Ultrastar He, the new HDD will be available with either a SAS 12 Gb/s and or a SATA 6 Gb/s interface. The Ultrastar He12 14 TB SMR version will be available to select customers only because this is a host-managed SMR HDD that requires applications to manage data transfers between SMR and PMR bands. Typically drives featuring SMR technology manage themselves automatically, which guarantees predictable performance, but does not take into account peculiarities of end-users' applications. Host-managed SMR HDDs rely on software to optimize their performance and/or power consumption. 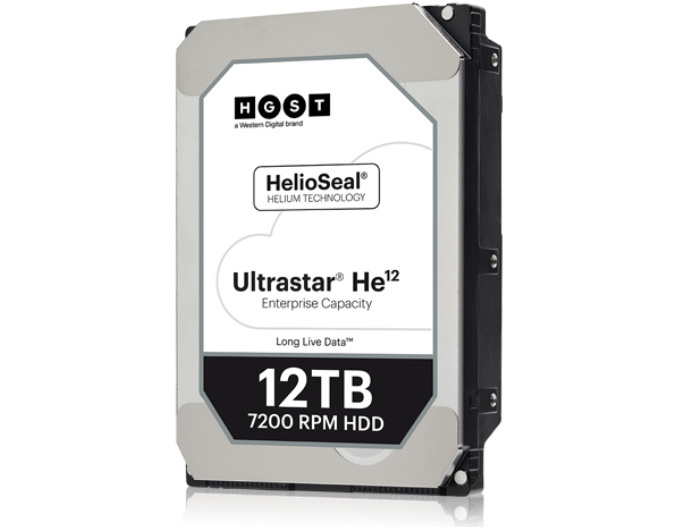 Other specifications of the HGST Ultrastar He12 12TB model resemble those of current-gen helium-filled enterprise-grade HDDs: the new drives feature 7200 RPM spindle speed, a 256 MB data buffer, a sustained transfer rate of up to 255 MB/s as well as an average latency of 4.16 ms. Power consumption of the 12TB model using SATA is set to be up to 7.2 W, whereas power consumption of the SAS model will be up to 9.8 W.
Since we are dealing with enterprise-grade HDDs, the Ultrastar He12 features all the technologies currently found in such hard drives from HGST including a special micro-actuator that improves the accuracy of head positioning in multi-drive environments, (which naturally improves performance, integrity, and reliability), rebuild assist mode to speed up RAID recovery time, and others. Finally, the new drives have SED options as well as Instant Secure Erase feature so to either quickly redeploy or retire an HDD. Right now, samples of the Ultrastar He12 HDDs are available to select OEMs. Western Digital plans to start commercial shipments of the 12 TB drives in the first half of 2017. The 14 TB version will be available in the middle of 2017. The drives will be covered with a five-year warranty and will be rated for 2.5 million hours MTBF. Prices of the Ultrastar He12 are unknown, but they will naturally depend on the number of HDDs acquired by a particular customer. The 14 TB model will be available to select clients only and their prices will be negotiated individually. Western Digital will not be alone with 12 TB HDDs in 2017. Last month Seagate implied that its 10 TB helium-filled drives would be accompanied by higher-capacity 12 TB models and it does not take a prophet to conclude that such HDDs are due in 2017. “[10 TB HDD is ] what we view as a tweener because it will have the 12 TB right on top of it,” said David Morton, CFO of Seagate, at the Next-Gen Storage/Networking conference organized by Needham & Company. We do not know whether Seagate also has plans for SMR-based 14 TB HDDs for cloud datacenters in 2017, but the 12 TB PMR model will clearly be an important one next year as the number of data that companies like Amazon, Google and Facebook need to host is growing fast. Since both large makers of HDDs are going to offer 12 TB hard drives next year, competition will keep prices under control (i.e., companies will not be able to demand a huge premium for these products). However, since we know nothing about costs and yields of the eight-platter Ultrastar He10 as well as nothing about Seagate’s 12 TB product at all, it is impossible to make guesses about any actual price tags here. When it comes to the next step for all HDD makers, the industry insiders consider HAMR as the most important technology transition for hard drives of the decade. HDD manufacturers hope to commercialize HAMR-based drives over the next couple of years, but are reluctant to disclose exact capacity points of technical aspects. Back in November the CFO of Seagate said that it could make financial sense to start HAMR roll-out with 16 TB models. 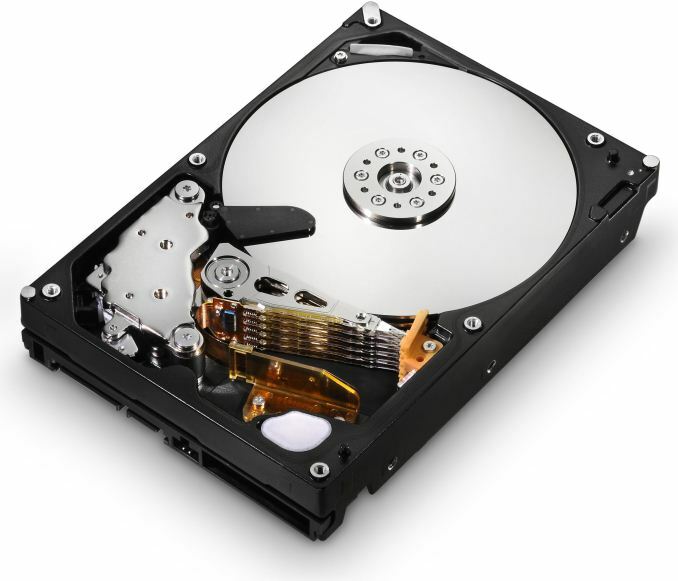 Due to the increased number of components and usage of new materials, HAMR-based hard drives are expected to cost more than traditional HDDs in terms of manufacturing, which likely means that they will carry higher price tags as well. 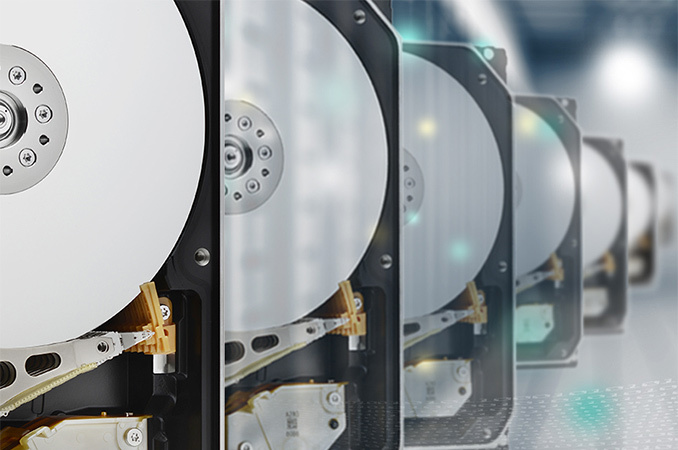 In a bid to make HAMR drives appealing to the customers, HDD makers will have to maintain their per-GB costs and performance at the levels of currently available HDDs. This is why companies like Seagate consider 16 TB as a right capacity point for the initial HAMR-based offerings. Right now, the mention of the 16 TB capacity sounds more like a consideration rather than a commitment, but if the companies are talking about capacities, then it means that they are confident of the HAMR tech itself. The big question is whether HDD makers already have internal HAMR roadmaps with exact capacity points, or they are developing them today. Now, while 16 TB is a hypothetical figure at the moment, if HDD makers manage to release such drives in 2018 (this year has long been discussed as the launch timeframe for commercial HAMR HDDs), they will offer tangible capacity upgrades to those, who use 10 TB drives now or plan to deploy 12 TB HDDs next year. The ability to store 3840 TB of data per rack sounds plausible for those, who use leading-edge PMR-based HDDs, but those with 14 TB SMR HDDs may be less interested in such an upgrade (especially given their investments in SMR). Wrapping things up, it looks like the HGST Ultrastar He12 HDDs (as well as competing hard drives with the same capacities) could be the highest capacity offerings from Western Digital before HAMR-based HDDs arrive over the next couple of years (yet, something tells me that these are not going to be the highest-capacity non-HAMR HDDs ever). Since it takes time to qualify new drives for datacenters and transition to HAMR HDDs is not going to happen overnight, it looks like the Ultrastar He12 drives have a long lifespan ahead of them. "For example, each standard server rack can store 2400 TB of data if fully populated with 10 TB HDDs today. If 12 TB hard drives are installed into the same rack, its total storage capacity increases to 2880 TB at the same power and at the same space, which is quite an upgrade." A fairly generic 4U JBOD chassis can hold 45x 3.5" hard drives today (SuperMicro SC836-series, for example). You can stuff 10 of those, along with a 2U head unit filled with HBAs, into a standard 42U server rack. That gives you 45 * 10 * 10 TB = 4500 TB of storage in a standard server rack with 10 TB drives.